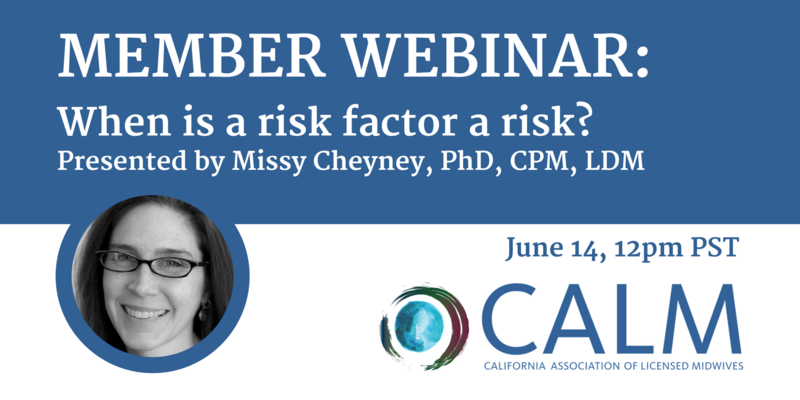 California Association of Licensed Midwives - CALM MEMBER Webinar: When is a risk factor a risk? CALM MEMBER Webinar: When is a risk factor a risk? When is a risk factor a risk? We know that home birth is a safe for low-risk women, but what do we mean by low-risk? Factors like maternal age, high BMI, or previous surgical delivery have previously only been studied in the hospital setting. New research examines the impact of these factors on outcomes in the community (home and hospital birth) setting. For more information, visit the event page on the CALM website.